ADE Turf Equipment has recently signed an agreement to become the new Victorian distributor for Jacobsen. Tim Coram is the managing director of ADE and is very enthusiastic about the partnership. A diesel motor mechanic by trade, Tim started the business in 1991 under the name All Diesel Engineering but subsequently adopted the name ADE Turf Equipment, which reflected the industry that Tim was targeting. 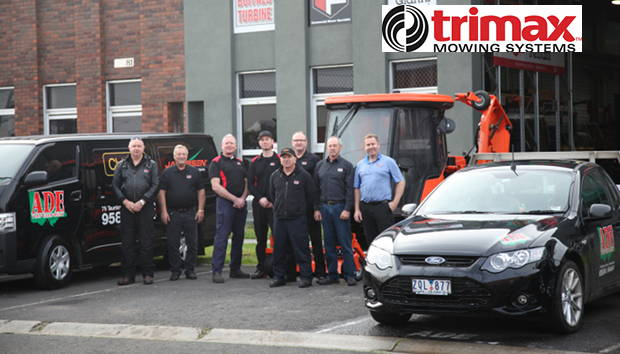 Tim says the company has grown astronomically, as he started off by himself, working out of the back of a ute and they now have 11 staff, including four mechanics, three sales representatives and administration staff. Noel Woodward, Tim’s Business Development Manager sees Jacobsen as a crucial part in the continuing growth of ADE Turf Equipment. “Jacobsen dovetails really well with our team’s skills and backgrounds and already we are seeing an upturn in enquiry. “We see a lot of optimism in the growth with Jacobsen and we have sales managers detailing both golf and the commercial mowing sectors. Tim has just doubled the capacity of ADE Turf by acquiring the adjacent factory. Coming from the trade, Tim has a unique understanding of the necessity to minimise downtime for machinery that ‘earns it’s living’. Tim had been a Toro commercial equipment dealer for ten years, finishing in 2010. Jacobsen was a natural choice as he sought to grow his business and so he approached Jacobsen this year to initiate the new partnership. “We parted company with Toro and we needed a signature brand with the best equipment lineup available to come back into the market. “There was an existing distribution contract with Jacobsen in place and that was becoming due for reassessment this year and so we initiated discussions to pitch our proposition which was all about service, support and experience. “One of the things I think that Jacobsen could see in our people was our golf and reel equipment experience. Tim says that the transition from the previous Jacobsen distributor, Godings has been smooth and business- like. He compliments Godings on their professionalism in dealing with the handover. Noel says that despite the fact they championed the Toro brand for a decade, he is not concerned about customers being confused by their switch to Jacobsen. Noel says that professionals in the industry have very good awareness of the three big equipment brands- Jacobsen, Toro and John Deere, and consequently from his experience the choice often comes down to trust in delivering the necessary service and support. “Because of our previous experience with Toro as a commercial equipment dealer, we are familiar with the benchmark that customers expect. It’s exciting to be already getting positive feedback on Jacobsen products, particularly in relation to quality of cut. “As Jacobsen distributors, our promise to customers is that we will support old and new Jacobsen equipment with parts and service support. Our experience over many years is that if you get your parts and service support right then equipment sales surely follow.